I know you were all dying to know what I wore to my 10-yr Reunion , right?! HA! Well here ya go. I showed you a sneak peak last week - that was one of the images from our Photo Booth (which turned out fabulously!!!) After all the help from the lovely ladies (this post) I was finally one the right track. I feel head over heels for a couple of them - tried to work my magic and track down a couple of the dresses in my size & without luck. So I hit the Internets hard, and then stumbled onto this little jem. Go big of go home right?! Well that's my motto! (plus being the planner/hostess of sorts a little spice was allowed!) The dress was def a hit with the ladies, a few of my guys friends commented how sparkly it was - you know guy speak for cute dress ;) I loved her and am ready to wear her again...Who is having a sparkle party? I'm Ready! New Years Eve? You bet...now to find to an occasion where sparkles from head to toe are totally required! Love this dress! It is so fun. Definitely a New Year's Eve look or maybe a Holiday party. Such a fun dress! You looked gorgeous! i just KNOW you were the best dressed at the reunion. you have been killing it with the outfits lately, tay! Taylor you look fabulous in this outfit! totally love this! Great find, and a red sole is the perfect accessory. Obsessed, obsessed, obsessed! So gorgeous!!! LOVE!!! Such a perfectly festive decision. Ooh, I love it! So fun, I love that you went full on sequins for your reunion! You look amazing! could you be ANY CUTER?! nope. you could not be. Obsessed with a) your dress b) your shoes.. those red soles are taunting me c)your facial expression in that second picture. Awesome. You look ADORABLE, Taylor. 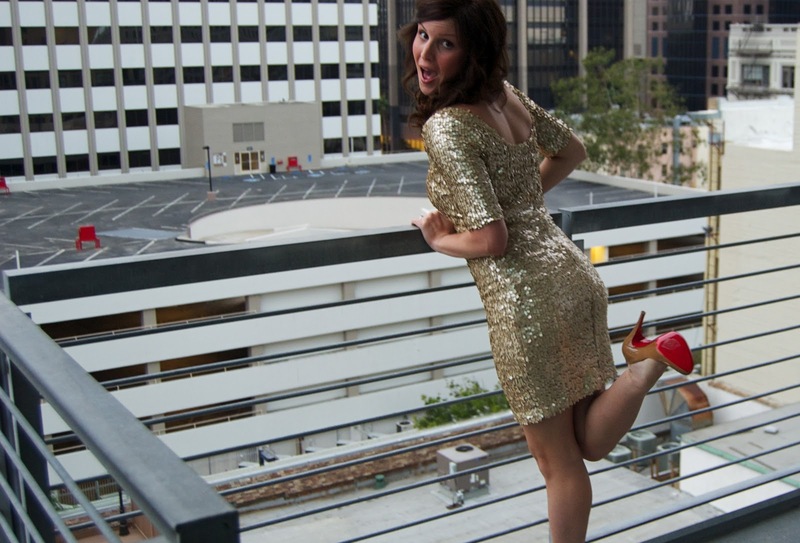 I love the sparkly dress and those Loubs are killer. And your curls are darling! That dress is amazing!!! In love!! Love the dress, so so fun! Love this dress! Perfect for a reunion, although I'll take any opportunity to wear some sparkle! you look amazing! i love the entire look! your hair looks fabulous too! :) cant wait to see you rock it again! 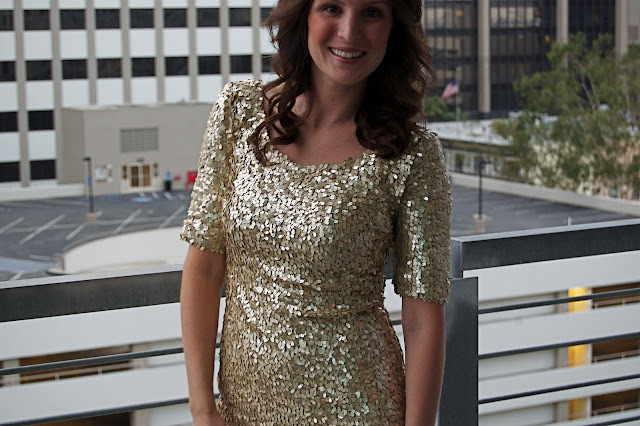 Wow, you look fantastic in this gold, glittery number! I see this being a good holiday/NYE dress for years to come. Must agree with Tina, your hair looks great. Just came across your blog! You have amazing style! I adore this glitter dress!! Fabulous!! P.S. You make those clutches on your etsy shop?! those are amazing! Do you have any more of the black and cheetah one you have pictured at the top of the page? I want it! You look amazing! This dress was made for you and you must find other events to wear it to!